Given his first long-term opportunity as a manager, Chris Hughton rewarded Brighton by getting them promoted to the Premier League in 2017, returning to the top division for the first time since 1983. If getting them there was the hard part, then keeping them there is the harder part. This was managed last year and looks set to happen again this season, however the future becomes a question of whether they are just going to continue fighting against the pull of relegation or look upwards to become a secure Premier League outfit. You will have a hard time finding anyone with something bad to say about Hughton. The former Irish international doesn’t feel the need for constant self-promotion like so many of his peers, remaining quiet and humble despite his popularity. Hughton doesn’t appear too ambitious in his plans for the Premier League. Looking for teams to emulate, he looks towards the well-organised defensive battlers whose main goal was simply survival. This marks out Hughton as a realist rather than an idealist, which has its upsides and downsides. His teams are unlikely to be the kind of undisciplined messes we saw at West Brom or Stoke, with players who were long past the point of caring barely putting in any effort, however they may instead be quite conservative and a hard sell to prospective players. The former full-back’s first concern is unsurprisingly defending. 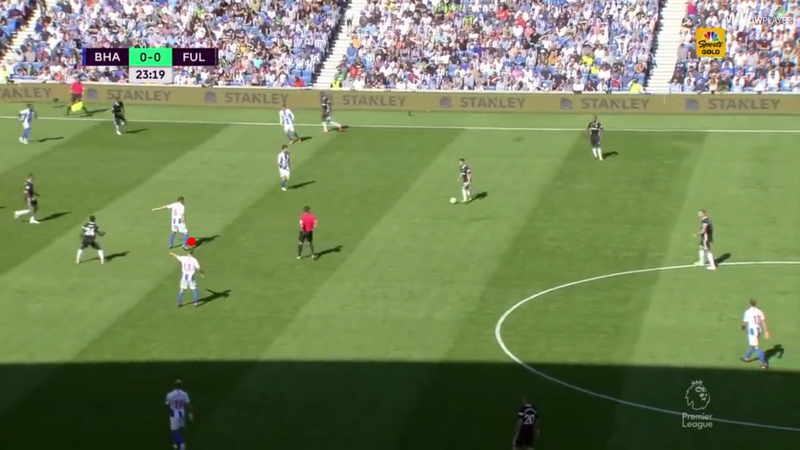 Brighton played in a 4-2-3-1 formation in their first Premier League season, dropping back into two banks of four with Pascal Gross and Glenn Murray ahead of them when defending. This is a standard strategy, so, while it doesn’t ask any new questions of the opposition, it’s simple to implement, allowing Hughton to bring in and switch players around easily, and Brighton’s first teamers definitely have the skillsets for it. Lewis Dunk and Shane Duffy have deservedly won plaudits for their partnership in defence. Both strong and dominant in the air, they can easily head away opposition crosses, and they position themselves well, taking proactive steps rather than waiting to react to danger and constantly communicating to ensure they don’t get caught out. The backline’s instinct is to drop off and protect the goal, quickly retreating to the six-yard box when a cross is about to come in. This makes good sense as none of the centre-backs are slouches but are unlikely to win many foot races any time soon. Although this does open up space ahead of them for the opposition to work in and get a shot away, it means that forwards are less likely to be put through for a more dangerous one-v-one against Mathew Ryan. 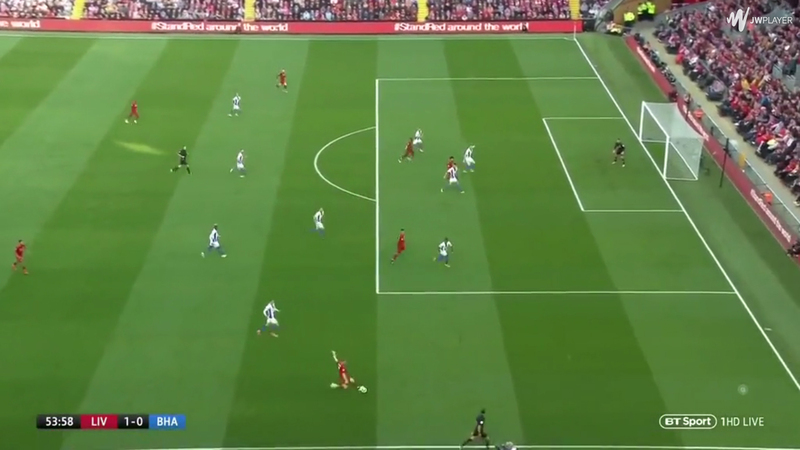 That space that opens up around the edge of the box does pose its own problems, but Brighton’s defenders will happily throw themselves in front of shots to limit the danger. Leon Balogun was brought in over the summer, but has struggled to displace Dunk or Duffy. He looks more aggressive than the starting pair, but also a little slower on the uptake – one quibble being that he tends to stand and ball-watch after making a header rather than immediately dropping back alongside his teammates for example. To the centre-backs’ left, Gaetan Bong is another good solid defender. Strong in the air and agile enough to nip in and intercept a slow pass, the Cameroonian is also good in one-v-ones, keeping his feet moving and quickly shifting his body to stop an opponent from dribbling past him or to block a cross. He does usually makes at least one rash challenge a match though. Bruno is also a solid right-back but, now 38, Hughton has looked to phase him out. He rotated with the more attacking Ezequiel Schelotto last year, who was loaned to Chievo after failing to make an appearance this season, and now Martin Montoya is generally chosen ahead of him. The former Barcelona, Internazionale and Valencia man is good, although maybe not as good as those former cubs might suggest. He’s calm and generally reads the game well, rarely diving in, possesses the acceleration to scuttle back quickly into position and is solid in the air despite only standing at 5ft 9. His preference to stand off his opponent makes it difficult to dribble past him, but he has a tendency to position himself too far from his man in one-v-ones, making it easy for them to whip in a cross. Bernardo also arrived in the summer. The Brazilian is tall and pacey but isn’t quite up to the defensive standard around him. His lanky frame has him often standing upright rather than getting lower, making it harder for him to quickly switch direction, while he is often caught awkwardly flat-footed in the box, allowing opponents to pounce on loose balls. This is pretty normal for a young player but it does stand out here because of the superior defensive work of those around him. Behind them Mat Ryan is an excellent shot-stopper in goal. 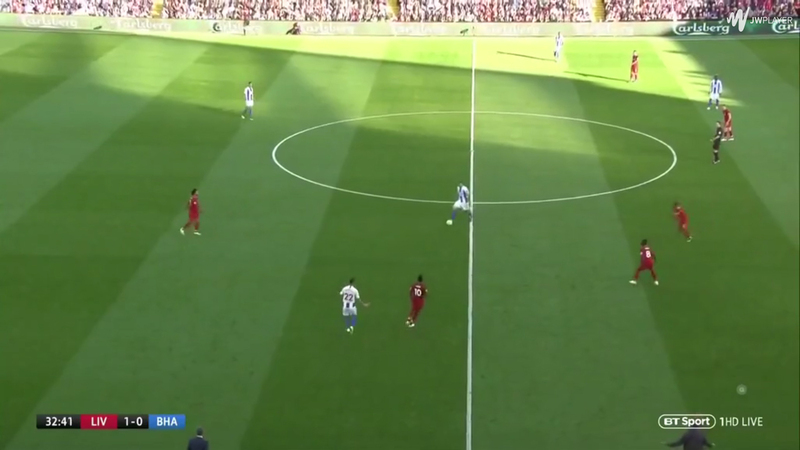 The aerial dominance of the centre-backs means he rarely has to come out and claim crosses, allowing him to stay on his line rather than exposing his lack of height. He always appears prepared to face down a shot and has excellent reflexes, flicking out a hand at the last second to send the ball spinning away. Dale Stephens and Davy Propper protect the backline. The two are fairly big lumps, strong in the air and combative tacklers but lacking mobility. Like the partnership behind them, the pair communicate well, constantly keeping their teammates updated on runners, and will position themselves to cut out passing lanes into the players behind them while sticking close to their men in midfield. 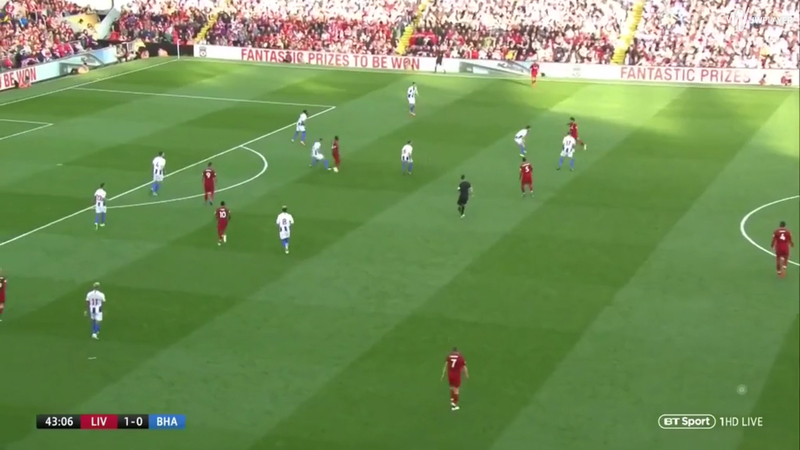 Their lack of mobility can pose a problem if the opposition outnumber them, positioning midfielders to pull them apart then passing straight into a third man between them. With Jose Izquierdo enduring an injury-hit campaign, Solly March has generally got the nod on the left with Anthony Knockaert on the right. The wingers are expected to track the opposition full-back, frequently dropping all the way back to the defensive line. They are hard-working runners and show intelligent defensive positioning for attacking players, angling their runs to block passes forward or inside. 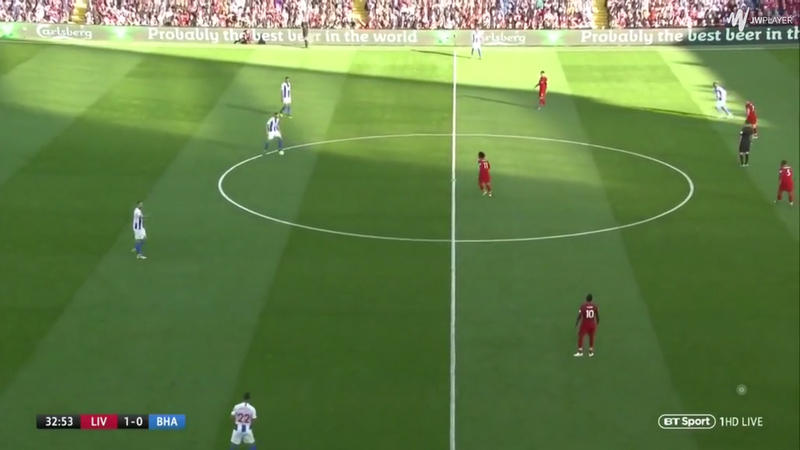 If the opposition full-backs pick up the ball in attack, it is generally the wingers who are expected to defend against them on the flanks, allowing the full-backs to remain in the box so that all four defenders are available to defend a cross. This preoccupation with the full-backs does pose problems however. 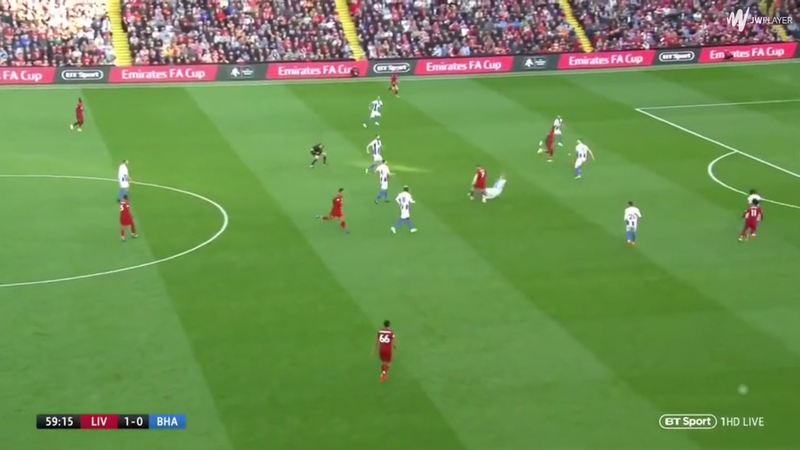 As the wingers remain quite wide to track the full-backs, noticeable gaps can open up between the centre-midfielders and wingers, making it easy for the opposition to play a pass straight between them. 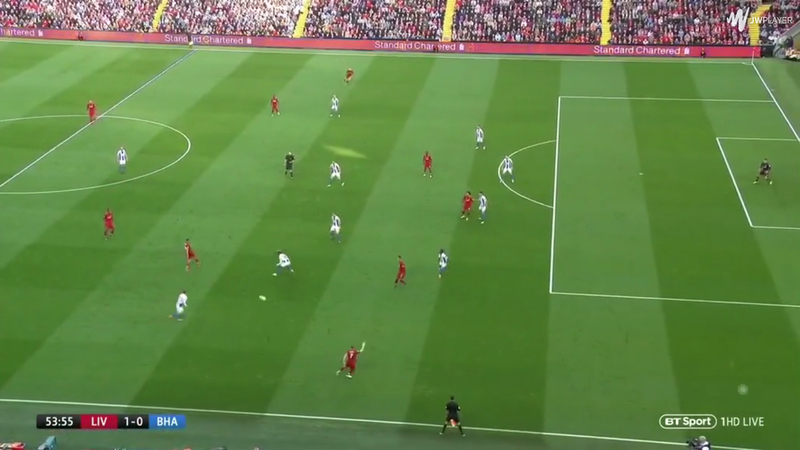 Because of this, the full-backs generally have to stick very tight to their men so that they don’t pick up the ball in space. 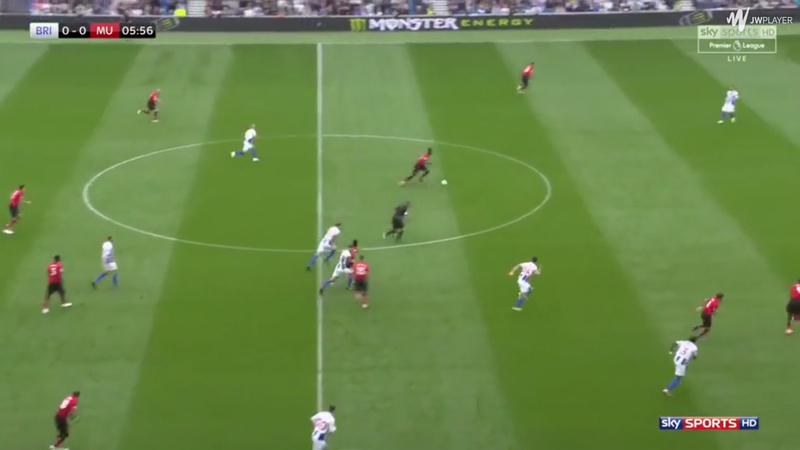 This can drag Bong and Montoya quite far from the defensive line, leaving gaps that the centre-backs are forced across to cover. 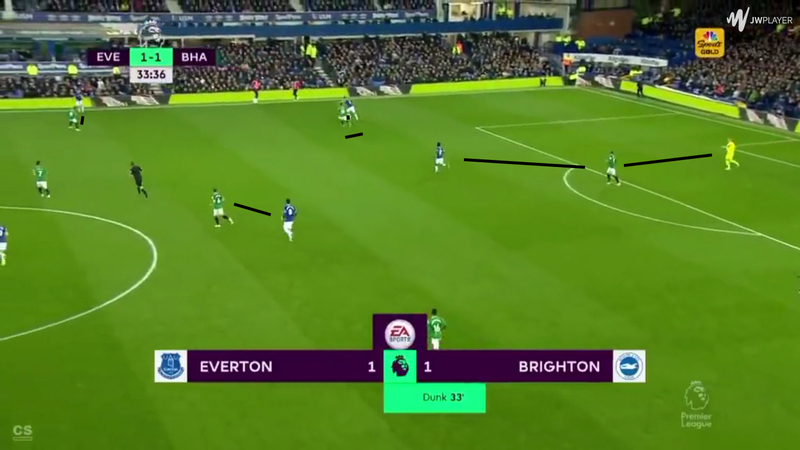 The full-backs are good enough defensively so that their opponents can rarely turn on the ball, but if they move the ball quickly enough with one-touch passes, Brighton can be left exposed and the spine of their side isn’t always quick enough to recover. 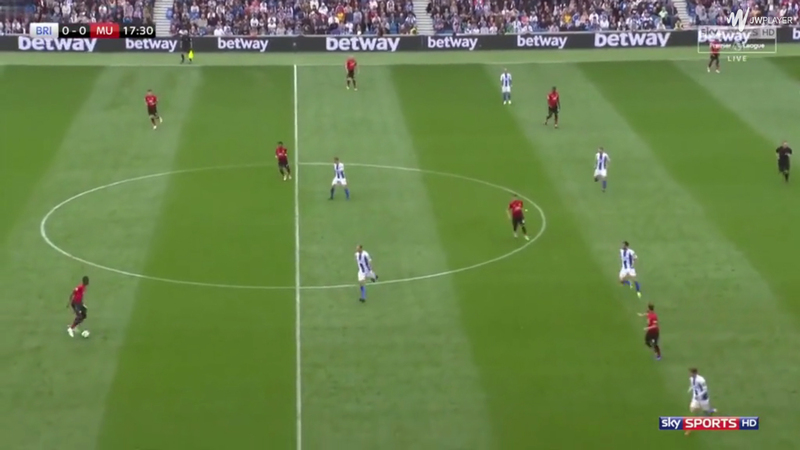 Even if the opposition don’t create a chance, this stretched midfield line makes it quite easy to play straight into attack, immediately putting Brighton on the back foot. Their backline are good defenders and brave enough to block shots, however maybe they wouldn’t be called into action so much if they could stop the opposition from getting into the final third so easily. 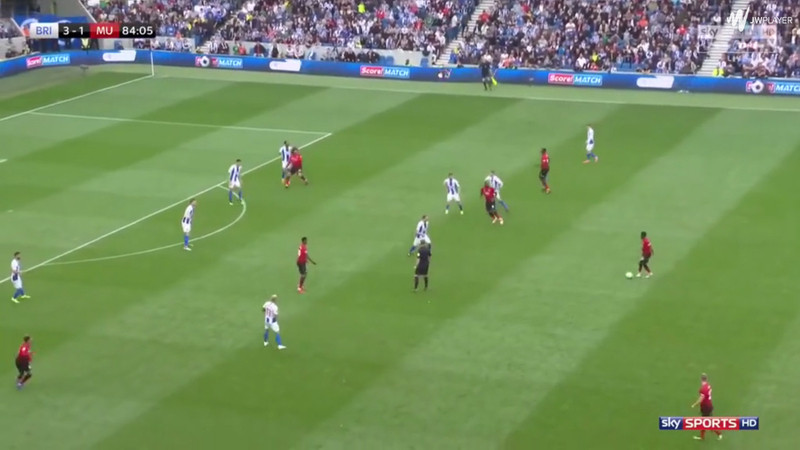 Brighton do often make it harder for the opposition to play through them by pressuring them. Gross and Murray start out protecting the centre, keeping close to the opposition midfielders, then they will push up to close down the centre-backs, angling their runs to continue blocking the pass into midfield. The wingers will push up to get close to the full-backs and the centre midfielders will push up too, sticking tight to the backs of the opposition centre-midfielders. This has mixed results. 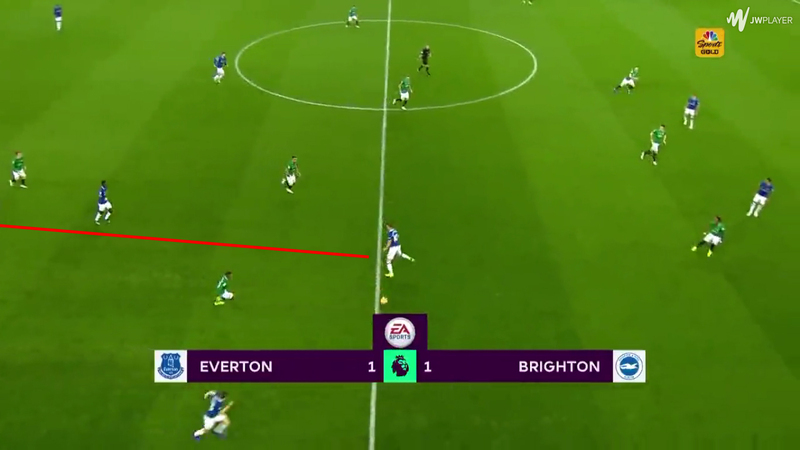 Brighton’s players are generally big and defensively strong, so capable of winning challenges – particularly in midfield, where few players are capable of turning out with Stephens and Propper breathing down their necks. 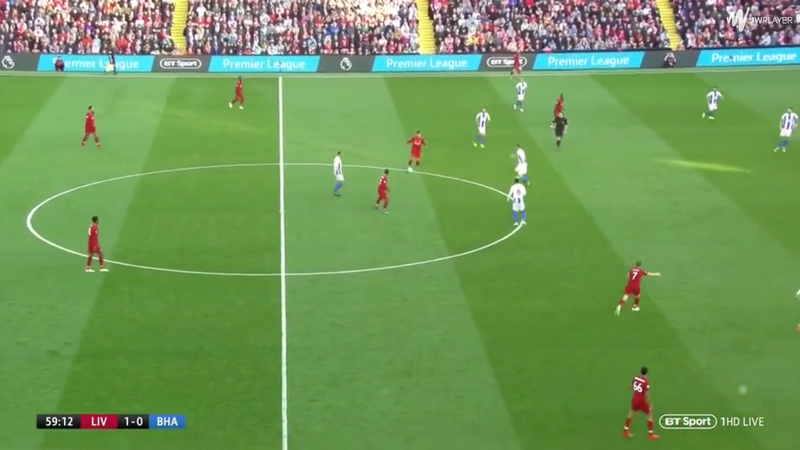 The man-orientated press means the generally immobile spine of the team immediately gets on top of their opponent, giving the opposition less time and space to work than a more zonal system would. 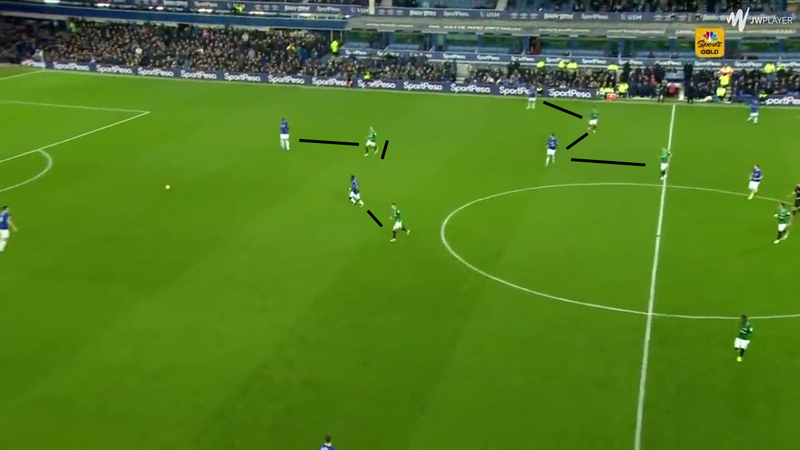 This does open up large gaps though, especially as the backline are reluctant to push higher in support of the midfield. 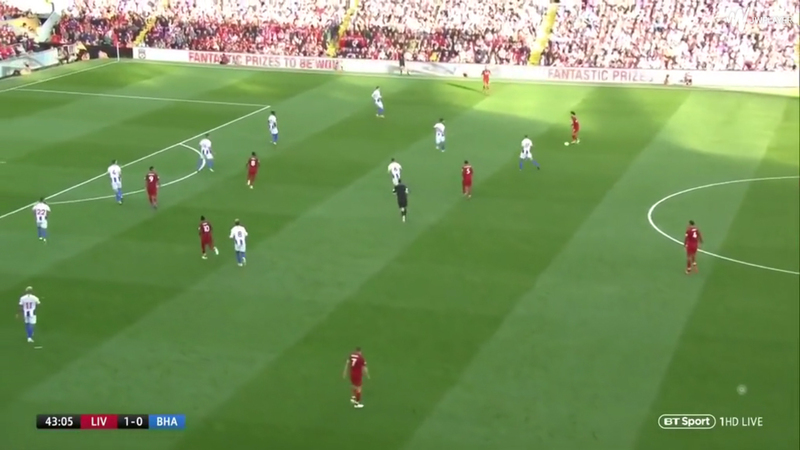 If they are comfortable enough to play around Brighton’s pressure, the opposition can play passes through the gaps to players in between the defensive and midfield lines, whether that’s an attacker dropping off or someone sprinting away from their marker who’s too slow to catch up. The main idea of their pressing appears to be to cut off the short passing options to force the opposition into playing a long ball, which their aerially dominant defence can easily win back. 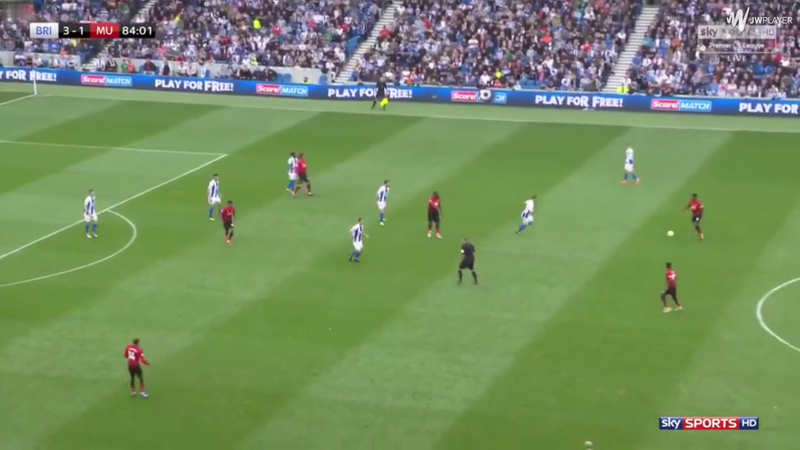 Knockaert is particularly good at winning the ball back high up the pitch though, quickly shifting direction to intercept passes, allowing Brighton to break quickly. Despite their aerial prowess, Brighton don’t seem to be particularly good at defending set-pieces. They mainly use a man-marking scheme, except for two players marking zonally: one at the near post and another along the six yard box. 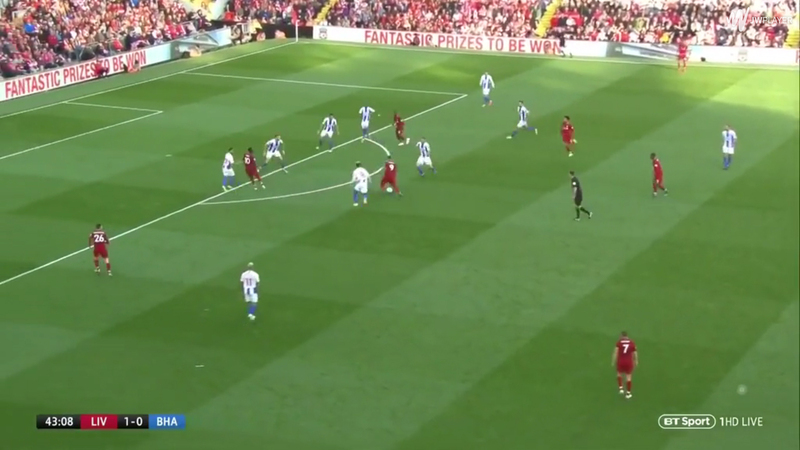 The rest of the defenders pick up men, so their positioning is dependent on the opposition, however, if they can get free, there is a fairly obvious weakness at the back post to be exploited. Brighton defend a corner using man-marking except for one man at the near post and one on the six yard line. Jake Cooper blocks Murray. Murray is pushed over so he can’t track Alex Pearce, who scores at the back post. Primarily focussed on survival, attacking can take the back seat at times for Brighton. The defenders will often pass among themselves but there is little attempt to really move the ball forward with this possession. 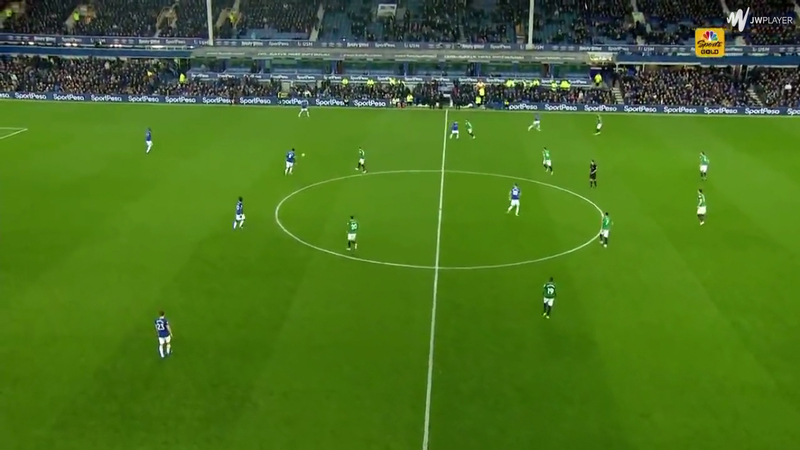 As they can’t work the ball forward, these spells of possession hold little purpose other than slowing the game down. 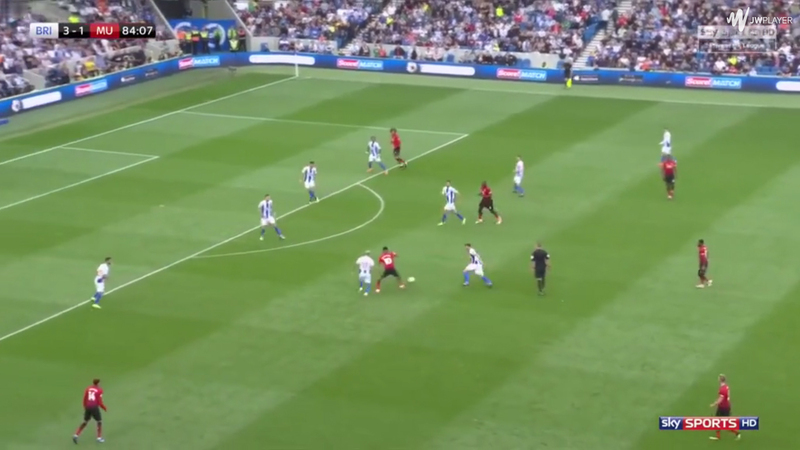 If anything, they pose a threat to Brighton as they frequently give the ball away, allowing their opponents to quickly attack. 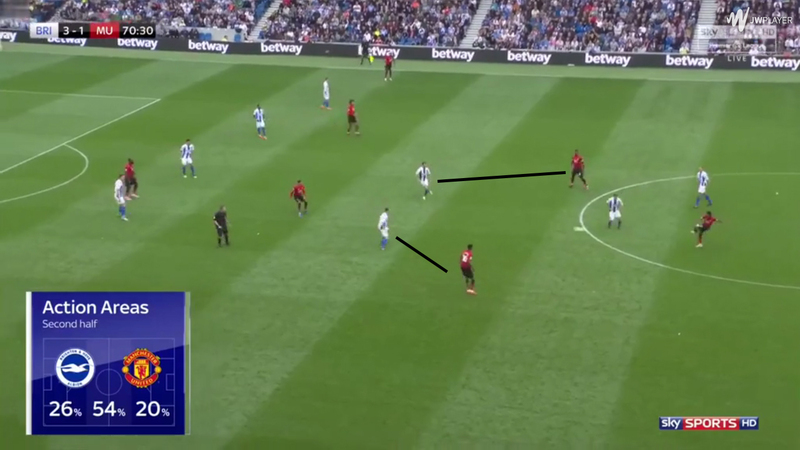 Brighton neither take up the positions to work the ball forward with short passes or have the players to do so, with both the defenders and midfielders prone to gifting the ball away. Instead, they play more directly. This is often hitting long passes up towards Murray, who can win pretty much anything in the air or hold up the ball, however as Gross lacks pace he is unable to flick the ball on for someone running in behind, as the opposition defence will generally mop it up with little effort. More often than not, the ball will go down the flanks though. The wingers are some of the few quick players in the team. March is a good crosser and keeps the ball well, taking short steps when dribbling to make it difficult to steal the ball from him, although this tendency means he doesn’t always take full advantage if there is space ahead of him to run into. Knockaert is more direct, picking up the ball and driving inside on his left foot to shoot or going outside to stretch play. He can pull off a piece of magic but also has a tendency to keep the ball too long, while attacking momentum can be lost when he has to cut back onto his left foot to cross from the right. The full-backs also get high and wide in support. None of them are particularly good crossers but are willing runners, helping to make space for their teammates. Bruno is one of the few defenders capable of moving the ball out of defence, often sending a pass down the line to the winger then rushing inside diagonally to receive the one-two, yet can’t be expected to do the necessary running for much longer, while Bong can pick out some nice passes over the top. Both Montoya and Bernardo are attacking upgrades over them though – athletic and good technically. Gross will also move out to whichever flank the ball is going down. The German is Brighton’s creative hub, capable of raining pinpoint crosses into the box when given the opportunity. 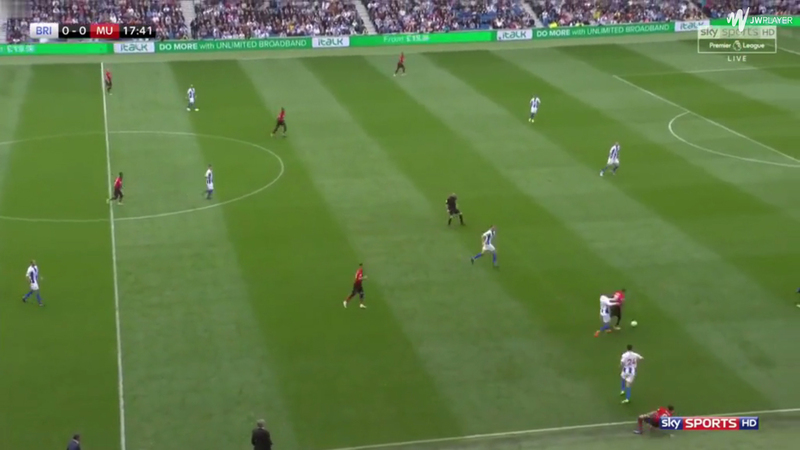 With him joining the full-back and winger out wide, Brighton will usually outnumber the opposition in this area, making it easy to get the ball into a position to cross. Murray is strong, dominant in the air and intelligent in his movement, keeping in the defender’s blindspot before darting in ahead to reach the ball first, making him the perfect man to be finishing off these crosses. He’s also better technically than he’s probably given credit for, calmly placing his shots and pulling off a neat flick against Manchester United. His lack of pace is a major issue though. At 35, he can’t be running in behind opposition defences and this severely limits Brighton’s ability to counter attack, especially with Gross not being blessed with pace either and the wingers having to drop very deep when defending. Without the ability to counter, Brighton often find themselves unable to build attacks, welcoming the the opposition onto them – difficult to deal with for 90 minutes despite how good their defenders are. Murray helps to work around this by often pulling into wide areas, dragging defenders with him to open up space for the faster widemen to attack through the middle. 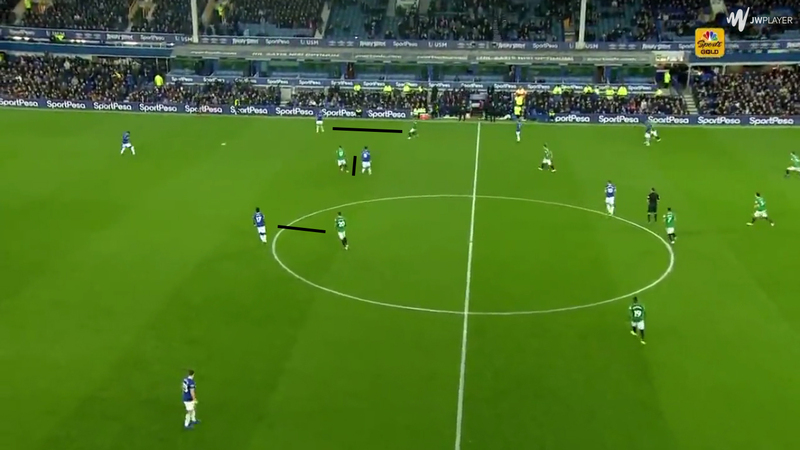 The wingers’ defensive responsibilities mean this isn’t always practical though. New signing Florin Andone is much faster, allowing Brighton to counter quickly, however, while possessing a good leap, he is nowhere near as good as Murray in the air. 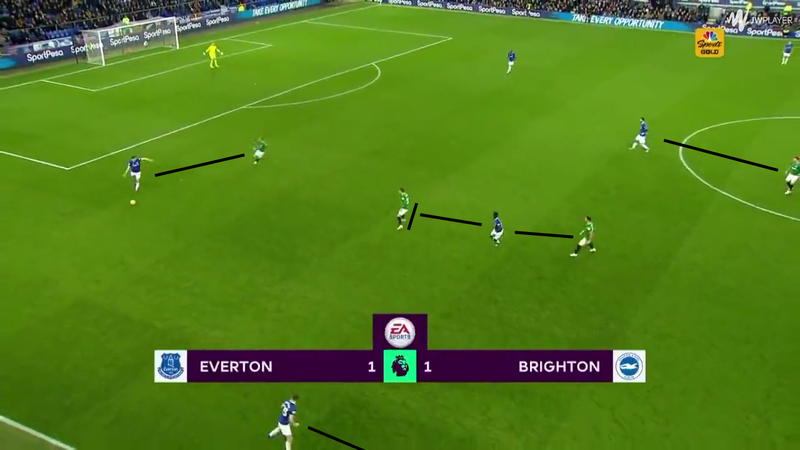 With Brighton’s primary attacking plan based around crosses, swapping Murray out for Andone requires a significant shift in strategy. Hughton has also attempted a formation change this season, sometimes moving to a 4-5-1. 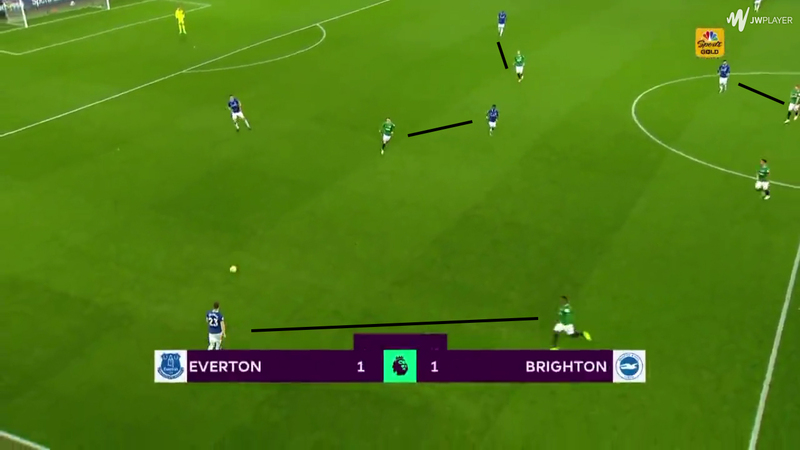 Even in the 4-2-3-1, Gross would sometimes drop back alongside the midfielders to plug gaps, so the switch to 4-5-1 makes that a more permanent shape. 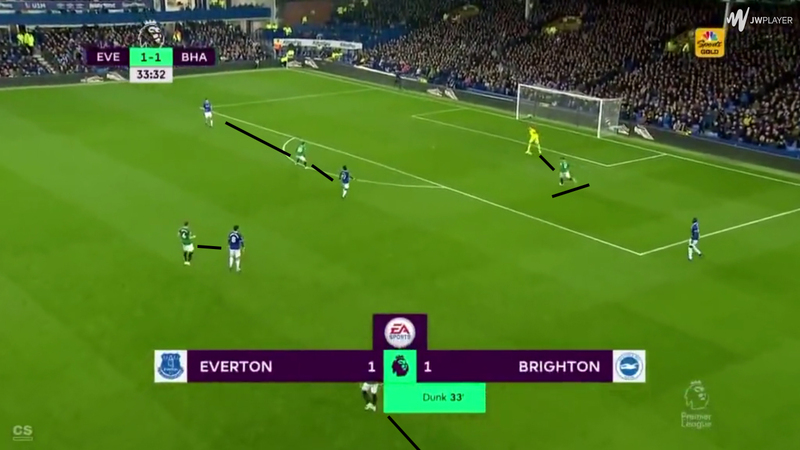 Defensively this helps to fill the gaps that open up between the centre-midfielders and wingers by adding an extra man to the middle, but it makes it harder for Brighton to press with just Murray in attack. 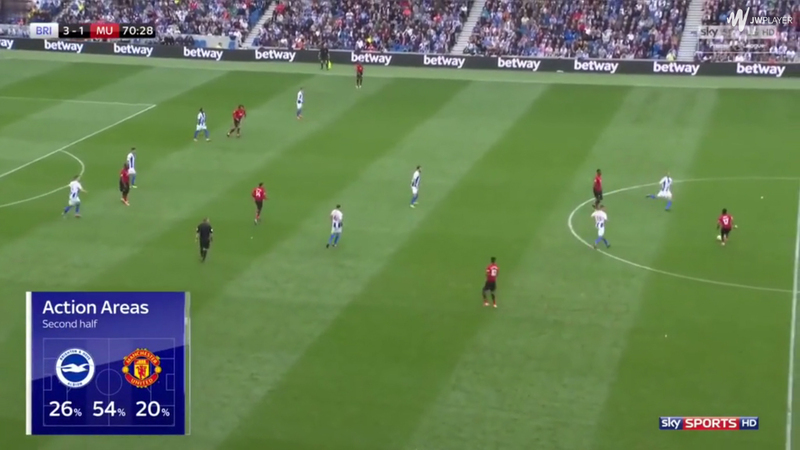 Brighton’s 4-5-1 is somewhat unusual in that the midfielders generally all play on the same line rather than having a designated holder. Gross sees more of the ball in deep positions, so Brighton can work the ball forward more, however it isolates Murray even further. 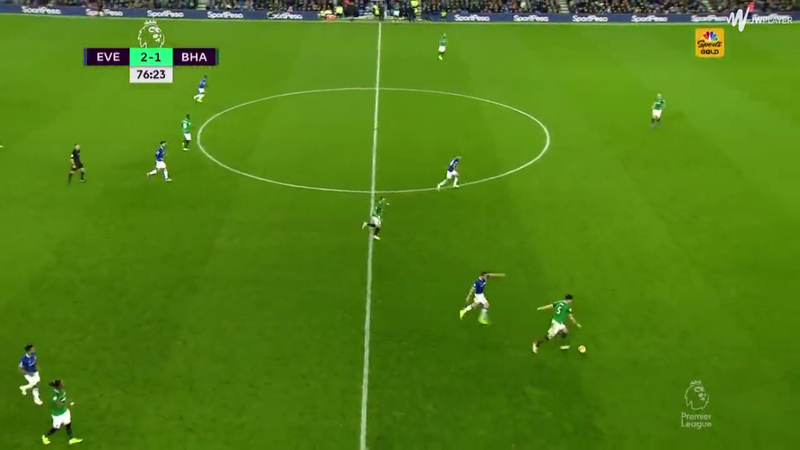 Yves Bissouma is also a new option in midfield, possessing the strong defensive qualities needed but also more athleticism and quality with the ball at his feet, while Beram Kayal can make box-to-box runs too when given a chance in midfield, however Brighton still lack the technical quality to make more patient play worthwhile. It’s possible that the switch to 4-5-1 is partially to give Jurgen Locadia some playing time but it’s not really worth it: he’s quick and hard-working, but he doesn’t make good runs and isn’t particularly good technically, with better options both up front and wide left. Brighton are a solid well-organised albeit undoubtedly limited side. Hughton is caught between a rock and a hard place in terms of progressing: to create a more expansive team, he needs to add athleticism and technical quality to the spine, however it’s difficult to do that without pulling apart what keeps Brighton in the Premier League.